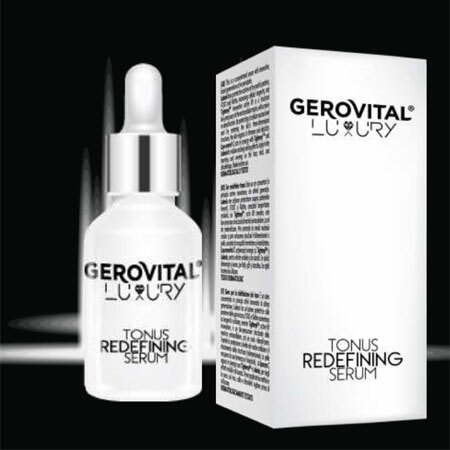 The The Gerovital Luxury Toning Redefining Serum is a concentrated intensive care product formulated with most advanced active principles designed to tighten and plump the appearance of skin. Its complex formula offers protection at cellular nucleus level and helps restoring the skin’s three-dimensional structure. Skin is revitalized and regains its youthful firmness and elasticity. Lakesis has a protective action on the youth’s proteins, FOXO and Klotho, increasing cellular longevity. Tightenyl™, the skin matrix Bio-lifter, firms and re-densifies the skin. Lipo-ceravit C stimulates collagen production, protects against free radicals damage, fades hyper-pigmentation. When acting in synergy with Tightenyl™ and Lakesis it offers visible and long-lasting anti-aging effects. Usage: Apply twice daily, in the morning and evening. Apply on cleansed skin all over the face, neck and décolletage. Layer underneath of moisturizer to seal in hydration. With the launch of the Gerovital Luxury line, Farmec celebrates 50 years of manufacturing of exquisite anti-aging cosmetics. Based on the latest discoveries in the vanguards regenerative medicine, the Gerovital Luxury line increases cellular longevity by bringing an infusion of youth and beauty to the skin. 15 revolutionary products, with complex formulas and high in active principles offer a complete skincare regimen, delivering instant and long lasting anti-aging effects. Dermatologically tested, they offer a pleasant sensorial experience and an absolute comfort for the skin. Lakesis is precious oil obtained from the resin of Mastic (Pistacia Lentiscus) tree, which is native to the island of Chios (Greece). Its role is to awake the proteins of youth in the skin, KLOTHO and FOXO, and reactivate cellular activity and dermal matrix regeneration. KLOTHO is a protein that circulates in the blood and brain/spine, having anti-aging and overall health benefits. It significantly enhances the antioxidant balance. The decrease in KLOTHO starts very early during the ageing process, from roughly 30 years. Increasing KLOTHO synthesis in the fibroblasts represents a tested and confirmed strategy to combat skin ageing. FOXO is one of the very few genes shown to have an association with human longevity. It activates the transcription of genes involved in cellular detoxification and the repair of DNA damage. Neurophroline™ has been discovered in the wild indigo (Tephrosia Purpurea), a native Indian plant used in the Ayurvedic tradition for its benefits on skin. It combats the signs of environmental aggressors such as pollution and climate and also treats the real culprit of ageing – stress. Neurophroline™ activates the release of a natural calming neuropeptide acting on mood, and visibly improve skin tone within two weeks. Apply twice daily, in the morning and evening. Apply on cleansed skin all over the face, neck and décolletage. Massage gently until completely absorbed. Layer underneath of moisturizer to seal in hydration.one to fine lines and dryness. Layer underneath moisturizer or on top of moisturizer, to seal in hydration. INGREDIENTS: AQUA, GLYCERIN, PENTYLENE GLYCOL, DISODIUM ACETYL GLUCOSAMINE PHOSPHATE SODIUM GLUCURONATE, MAGNESIUM SULFATE, GLUCOSYL CERAMIDE, SQUALANE, SODIUM HYALURONATE, ASCORBYL TETRAISOPALMITATE, GLYCOPROTEINS, GLUTAMIC ACID, THREONINE, NIACINAMIDE, ETHYLHEXYLGLYCERIN, HYDROXYETHYL ACRYLATE / SODIUM ACRYLOYLDIMETHYL TAURATE COPOLYMER, SORBITAN ISOSTEARATE, POLYSORBATE 60, PHENOXYETHANOL, DECYLENE GLYCOL, CAPRYLYL GLYCOL, MAGNESIUM ASPARTATE, ZINC GLUCONATE, COPPER GLUCONATE, TOCOPHEROL, HYDROGENATED PALM GLYCERIDES CITRATE, CAPRYLIC / CAPRIC TRIGLYCERIDES, PISTACIA LENTISCUS GUM, DISODIUM EDTA, PARFUM, ADENOSINE, BENZYL SALICYLATE, SODIUM METABISULFITE. Leaves skin residue-free, smooth and fresh.